Net profits after minority interests have grown by 44% YOY to Rs. 198crores. Strategy for the firm is doubling, durability and de-risking. Doubling strategy’s target is to double their income and multiply our profits by 2.5 times. GST and RERA have been passed recently . GST more smoothly passed then demonetization . Reduced exposure to large ticket loans. The firm’s Balance Sheet is becomingmore granular, lot more retail oriented,and lot more geographically diversified as well. Loan AUM grew 26% YOY and 5% QOQ to INR 23,3000 Crores. Profit after tax grew by 31% YOY to INR 116 Crores. Net Worth – Rs 3580 Crores. Headcount grew by 5% YOY to 7800 members. NBFC branches still same at 1114 . More than 10% of home loan business are Swaraj loans. 4500 approved housing projects up from 2000 in 2016 . Cost of borrowing declined by 20 basis points QOQ and 140 basis points YOY to 8.6 %. Borrowing from banks at their MCLR . NIM at 6.6 % up 50 basis points YOY and down by 21 basis points QOQ . 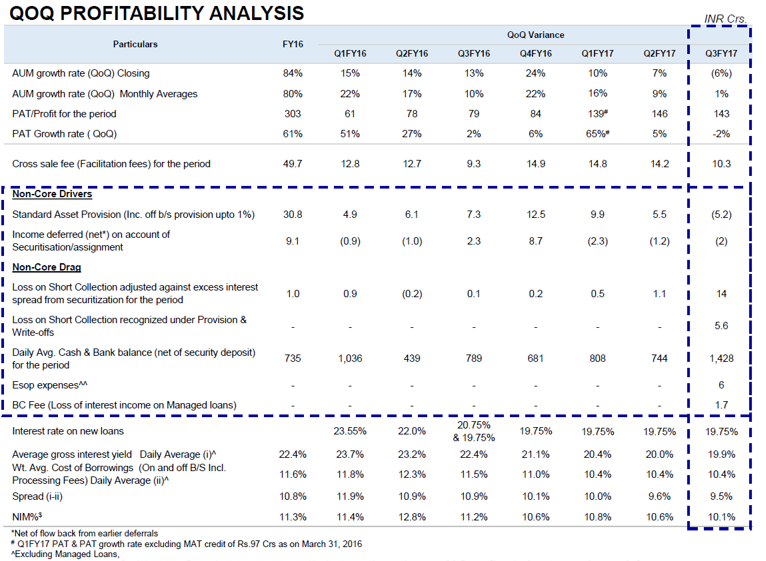 Cost to income ratio at 39% down 370 basis points YOY and flat QOQ . Wealth PAT grew by 64% YOY to RS 86 Crores . Assets under advice, management anddistribution have grown 60% YOY and 17% QOQ to reach Rs. 1.26 trillion. Provided breakup of the retention yield into fee-based and fund-based yield. Provided breakup of our retention yield into fee-based and fund-based yield. The firm raised Rs.11,250 crores in net new money which is 50% of the net new money garnered in the whole of FY17. In AMC, the firm raised Rs. 4000 crores in special opportunity fund to invest in pre-IPO and IPO situations. AIF assets have grown 67% YOY to more than Rs. 8300 crores. 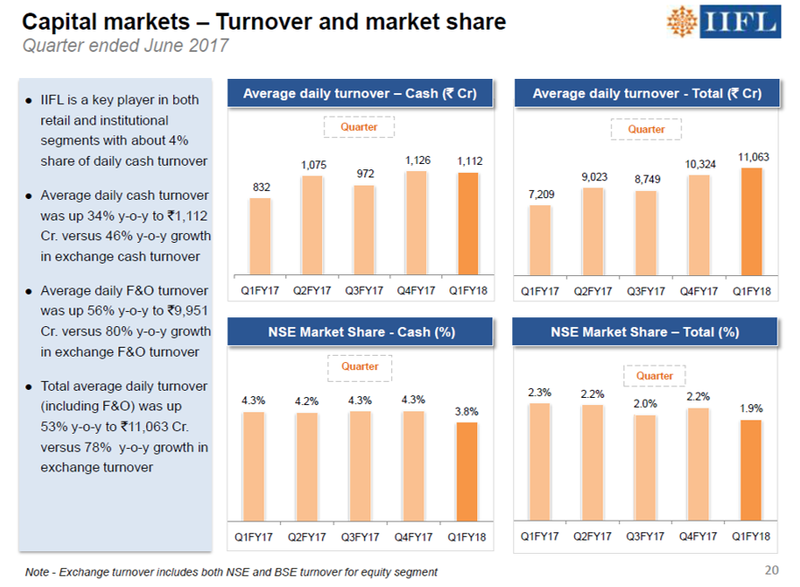 Average daily cash turnover was up 34% YOY to Rs. 1112 crores. Average daily total turnover was up 53% YOY toRs. 11,063 crore. 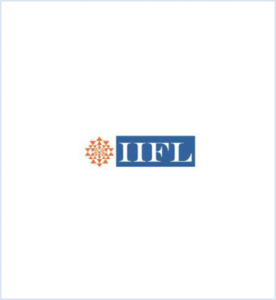 IIFL is ranked number one investment banker in equity issuances from January 1, 2016, to June 30, 2017. Commercial Vehicles finance which was hit by the demonetization is starting to look up. The payment cycle from bank operator has gotten longer post demonetisation. GNPA were at 2.04% up from 1.82% . NPA’s largely in the CV segment , as industry is still going through a slowdown in volume growth and collections . 100% gold loans , 77% of CV loans , 26% of HFC Loans and 71% of SME loans were booked in digital mode in June 2017 . 14% of Gold loans were sold through E-Sign. Launched UPI-based collection on the mobile app to allow seamless and real-time payments into the loan account. Assets under advice for the firm was Rs. 284 crore . North business potential not fully utilised . 1100 Branches in the country. For Small Ticket loans , the firm has digitized the process for loans . They plan to create insta loan for loans less than 10 lakhs . Rs 10 – Rs 50 lakh loans is main focus for the firm. P&L is not affected and is Rs. 34 Lacs due to dispensation in Q3. Mid-term loan MTL ticker size has increased from Rs. 10755 to Rs. 25421 with an average offtake of Rs. 20704. Approx. disbursements of 3000 crores, AUM has also fallen from Rs. 9000 crores to Rs. 8500 crores Q-o-Q. Took hit of Rs. 20 crores on the securitization front in the P&L. NIM has decreased from 10.6% to 10.1% because Rs. 14 crores loss on short collection. Banks have reduced the MCLR which has reduced the cost of borrowing for BFIL by 35 to 50 basis points. 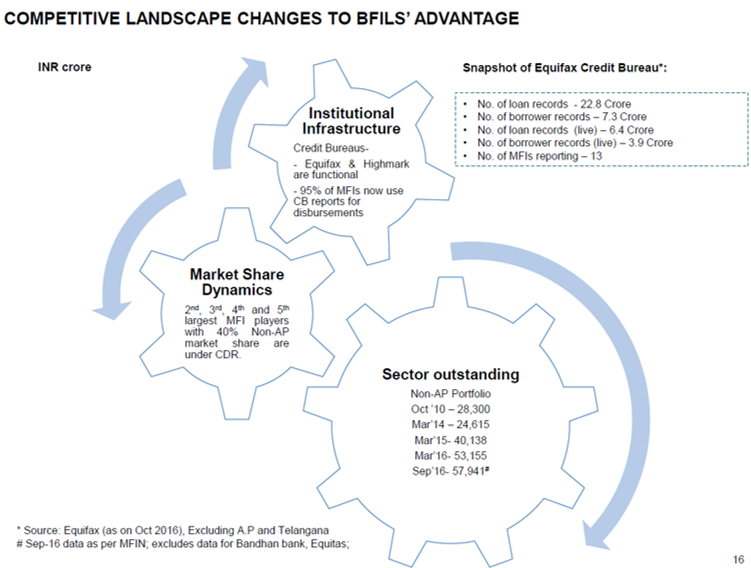 BFIL will be retaining the benefits by reduction is cost of borrowing in the upcoming FY. BFIL provided android tabs to all loan officers to do cashless disbursement of loan thus reducing the turnaround time by 10%. Shifting to Tabs, E-sign, E-KYC and involvement of Aadhar based biometric identification helped in achieving instant disbursement of cash. The biggest execution challenge with BFIL is about scaling 9422 sangam managers, about 226000 centers every week. Focusing on BHIM 5.0 version which involves transaction based on Biometric Aadhar. BFIL is following a 3C’s strategy going forward, targeting on customer delight, competitive advantage and cashless transactions. Their securitized portfolio is Rs. 917 crores and managed portfolio is Rs. 723 crores. The lag is not seen in whole of Maharashtra or U.P., but in certain parts of it, for example the lag is in Nagpur and Amravati region in MH and Western U.P. has been a problem. In rural India, there is not much options for microfinancing so, borrowers must go back to money lenders and borrow at higher rate of 48%. This makes BFIL a preferred lender for rural India. BFIL involves JLG model and they meet their customers 4 times a month which is far greater than the competition. 80% of the centers are Rural as compared to the industry level of 42%. Loans are turned into NPA only when they are overdue more than 60 days. BFIL send 30 lakh messages to its membersand used leaflets to target its customers, focus on different pockets to communicate that they are willing to meet in person to the customers. Demonetization led to negative growth of 6% Q-o-Q in the portfolio. In Q3FY17, 38% YoY growth in GLP which is 33% from increase in number of borrowers. Factoring an increase in ticket size of 10% in 2018. BFIL is expecting a growth of 50% as the demand is high even after considering demonetization. 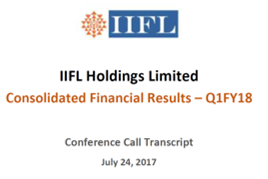 BFIL is Expecting to disburse 3300 crores in Q4FY17 and to maintain the portfolio at Rs.8500 crores by March ’17. 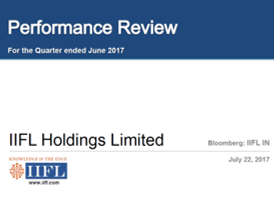 The portfolio will remain flat as BFIL will be disbursing its collections, but in the next year 50% portfolio growth is expected. Overall collection efficiency is first 20 days have improved in the affected geographies. Renewal ratio of loans is about 75% to 80%. BFIL is expecting a 30% increase in customer base from March 2017. BFIL offers 19.75% interest rate, the lowest among the private sector MFIs and they are operating at a spread of 8.7%. BFIL has the account details of about 50% of its clients and 23.5 lakhs of which were sourced through UID and 7.8 lacs were NEFT enabled. The tenure for the Mid-term Loan MTL has also been increased from 50 weeks to 75 weeks. The contribution mix of MTL as a % of GLP has changed from 28% to 23% in Q3. Overall customers added in this quarter is 4.7 lakh compared to 7.9 lacs in Q2. 75% of the term disbursement is to existing customers. Weighted average maturity of their loans is 5.8 months with 55 lakh active borrowers. Around 1.6 lakh centers still working at 100% collection efficiency in Maharashtra and U.P. Bureau rejections are in the region of 25%. 23 lakh accounts are sourced on ABPS front. In Bihar, Chhattisgarh, Jharkhand and Orissa 99% of the normalcy has been achieved and the 1% of the payments were not been made because of lack of currency generated during the phase. 90 days limit is given to the women living in border areas of Maharashtra, Madhya Pradesh and Karnataka, but still 80% is the repayment rate of the women living in the north region. Disbursement was effected due to lack of cash in the system. Repayment rate will take few months to come back to normal. Going cashless, they have started disbursement directly into the bank accounts. Total revenues increased by 34.5% year-on-year to Rs.4081 million in Q3 FY17. Gross profits increased by 26.6% year-on-year to Rs.790 million in Q3. However, gross margins have decreased by 122 bps from 20.6% to around 19.4% year-on-year. The share of our value-added products increased from 76% to 86% on year-on-year basis. Q3FY2017 EBITDA increased by 37% year-on-year to Rs.376 million. EBITDA margin increased by 16 bps year-on-year to 9.2% in Q3. 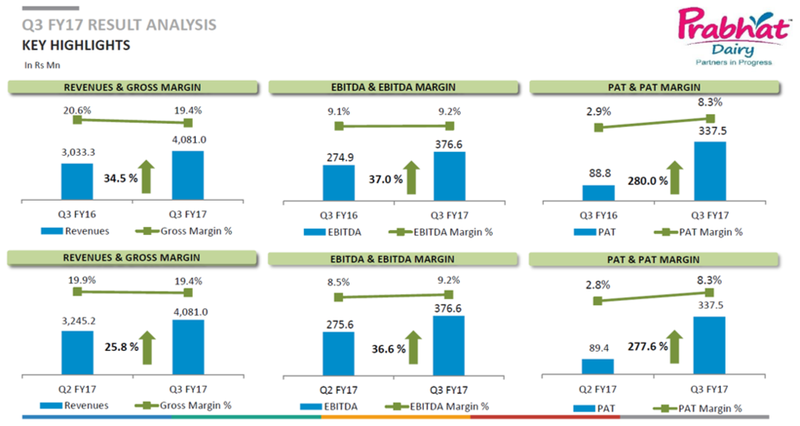 PAT increased by 280% year-on-year, PAT margin increased by 534 bps year-on-year to 8.3% in Q3 FY2017. Receiving of Rs.256 million this quarter as a part of megaproject income, which pertains to FY2015, FY2016 and H1 of FY2017, boosted profitability significantly. Inventory for the quarter end stood at around Rs.110 Crores and debtor number stood around Rs.300 Crores for this quarter. Milk procurement cost has particularly gone up to around Rs.27.20 in Q3 FY 17 from Rs.22 in FY2015-16 and Rs.25.6 in Q2 FY 17. Purchase price rise is around 6% to 10% of the overall milk because it is the percentage procured by print channels and 65-70% of milk is procured from the company’s channel. Value-added product category, which includes the specialty dairy powders, cow ghee, condensed milk, and cheese,comprises more than 80% and out of total revenue, around 30% comes from the consumer segment. Of the 20% liquid milk, 86% is for pouch milk business. This mix will continue to be there as it is takenat anoptimum level. Price of Skimmed milk powder (SMP) significantly increased because there was also alot of inventory in the country. Now the inventory has gone down,and prices are expected to remain stronger in the years to come. Current cheese capacity is around 30 tonnes per day, which includes raw and processed cheese. On a per day basis, only8.5Lacs liter milk is procured in Q3, as compared to 7.5Lacs Liter in Q2 FY16, because of the draught situation. Out of Rs.256 million, total benefit accounted for till this quarter is around Rs.29 Crores out of which around Rs.3.17 Crores are for current quarter Q3 and Rs.25.60 Crores is for FY2014-2015, FY2015-2016,and H1 of FY2017. The company has received Rs.4.50 lakh till the date, as a first refund and in the process of getting another refund of around Rs.12 Crores, which pertains to FY2015-2016. The company has around 18% to 20% utilization of the capacity for cheese manufacturing. And it targets 40-50% for the next year. Around 65-70% of the procurement is sourced directly from the farmers and the rest is sourced from the third party agent. In B2B, contact duration depends on the product, ranges from 3-6 months to 2-3 years. The company aims to scale its B2C business and grow its share from around below 30% to around 50% in terms ofrevenues by 2020. It has recently started modern trade in Gujarat and by this quarter and plans to expand the modern trade presence across India. The company anticipated that in the couple of years it would be able to get around Rs.100 Crores plus of tax as a refund depending on what sales and how much amount of sales happens in the states, outside state and all. As of now, the company is new to cheese industry. In the next two years, the company tends to go in high value-products of whey when it will be handling enough quantity of cheese. Since the company has a lot of un-utilized capacities, its major focus is fully utilize the capacities and to grow in the regions where it has already started selling products. Atul Auto has seen negative growth of 12.42% as compared to 19.54% de-growth of overall industry. Net profit margin for Q3FY17 is 9.19% as compared to 9.68% in previous quarter and 10.56% in Q3FY16. EBIDTA margin has remained 15% for Q3FY17. EPS for Q3FY17 is Rs. 5.6 which is down by 0.69 paisa compared to Q2FY17. 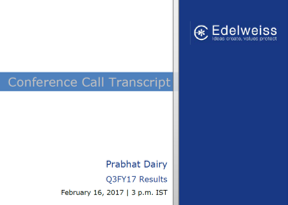 Raw material consumption has increased by 41 basis point on account of increase in commodity prices.Because of increase in raw material cost, EBIDTA for Q3 has dropped by 1% compared with Q2FY17. Account receivables has reduced as compared to previous quarter and debt-free status is maintained. Volume for the company in domestic market has dropped by 18.9% which is in line with industry’s drop of 18.3%in Q3FY17. In overseas market, the company has achieved 7x the volume of Q3FY16, while the industry saw decline of 22%. In Q3FY17, the company has sold 11,043 vehicles with turnover of Rs. 133.76 crores as compared to 11,761 vehicles and turnover of Rs. 142.7 crores in Q2FY17. Domestic sales for Q3FY17 has remained 10,116 vehicles as against 11,253 vehicles for Q2FY17. Export sales have increased to 927 vehicles against 508 vehicles in Q2FY17. Out of 11,043 vehicles sold in Q3FY17, passenger auto is 6069 vehicles and remaining are load carriers. The market share of the company in cargo segment has remained 18% whereas in passenger segment it is 6%. Till December 2016, the overall Auto industry of India has registered a positive growth of 6.67%, domestic market grew by 9.42% whereas export has de-growth of 7.37%. Because of the impact of Demonetization, volume growth for auto industry has remained negative 3.33%. 3-wheeler industry has seen overall decline of 14.8% till December 2016. Domestic market have flat growth rate of 1.88% while in international front, export have declined by almost 35%. BS4 complying products are ready. The company will get certificates of the products by end of February 2017. When BS4 becomes effective from April’17, raw material cost may go up between 5% and 7%. The company is likely to launch E-rickshaws from Q1FY18.The market size for electric vehicle in India is around 150,000 a year at 10,500 per month. The product will approved by authorized certifying agency and it will be meeting government norms. The product will be distributed through authorized dealers so after-market services will also be available. Warranty will also be available on critical components. The company will tie-up with retail finance company for easy availability of finance. 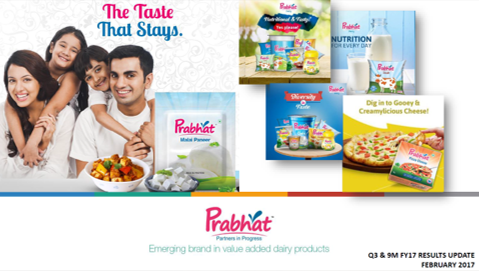 Margin on these products will be in line with regular products. The company have 200 primary and 120 secondary distributors in the domestic market and 10 distributors in overseas market. As of now, the company is selling majority of diesel and petrol fuelled vehicles in Gujarat, Haryana, Rajasthan and Punjab. Dealers’ stock levels have come down in Q3FY17 as compared to H1 of current fiscal year. Retail stock levels have gone up. The company has already crossed FY16’s figure of export of 1500 vehicles in first nine months of FY17. The company is targeting African markets and Latin American markets which are major destinations for 3-wheelers other than India. Demand for products in Africa is around 1,75,000 units per annum while for Latin American countries market demand is somewhere between 50,000 and 60,000 units per annum. In Africa the company is facing the challenge of having USC from the buyers. The African buyers are unable to get the FOREX which is a major concern in developing market.